The first day of the Federal Parliament's second last week before the election was Monday 17 June, an anniversary of some significance, depending on your literary, political or sporting interests. It was, for example, the birthday of Venus Williams (1980) and German Chancellor Angela Merkel (1954) and of Igor Stravinsky (1882), a brilliant, controversial composer. And Shane Watson (1981), a sometimes brilliant, recently controversial cricketer. And Henry Lawson (1867), whose mother, Louisa, not born in June but commanding our attention by a few degrees of separation, would have found Australian political life during the past few weeks utterly fascinating and somewhat familiar. 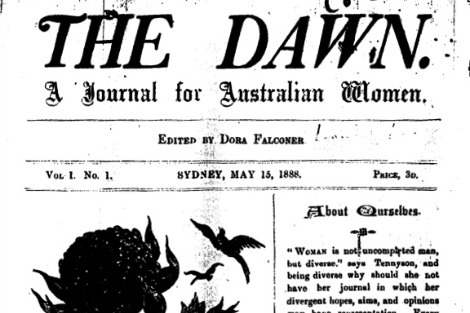 Founder and editor of The Dawn, easily the most successful women's journal of its time, Louisa Lawson was a courageous, dynamic and indomitable supporter of women in all their aspirations. These included the vote, equal opportunity in the workplace, marriage law reform, independent as distinct from husband-governed access to medical treatment, and, as a prerequisite of all these, respect. Louisa entered the world of men respectfully but firmly and, eventually, paid a personal price for having done so. But for a couple of decades she gave various entrenched male monopolies such a run-around as to establish her name as a pioneer of women's rights in Australia. As her influence grew and as The Dawn's reach stretched far beyond Sydney, various forces and organisations turned their attention to silencing this mouthpiece. To produce The Dawn, for example, she employed only women, 11 of them. To her surprise this brought her into head-on conflict with the New South Wales Typographical Association which banned The Dawn, mounted a scare campaign against its sponsors and argued 'it is not in the interests of humanity that young girls or young women should be employed at an occupation 50 per cent of whose followers die of chest and lung disease'. In the sacred name of humanity the compositors step in to save unthinking women from sacrificing themselves on the altar of this fatal occupation ... women are not wanted in the trade, because it is a nice, easy, healthy occupation, where wages are kept at a good level, and therefore well suited to the tastes of the present possessors. Louisa won her fight with the union and triumphed in numerous other skirmishes designed to show women they should not enter the male domain of public life and business. When a cocky young, impeccably dressed journalist from a rival paper, The Christian World, entered the Dawn premises unannounced and uninvited and began to goad the busy staff, he was ordered out by Louisa. When he announced that he was 'not ready to leave', she threw a bucket of water over him. When still he stood firm, she picked up a bucket of lye, used for cleaning the type. A thick black scum jellied across its viscous surface. 'Do you see this?' she said, holding the bucket an inch from his nose. 'Do you think you might be now ready to go?' He left. Where he had stood defiant there remained only a large puddle. Taking a holiday from the well-established Dawn, Louisa invented and patented a mail bag buckle which solved a long running problem of mail transport. She stood to make enough to finance her retirement and cope with increasing and debilitating health problems, but the Postmaster General, Patrick Crick, stole her invention. Her compensation of £300 was reduced on appeal, after a long and exhausting legal battle, to 60. On the face of it, life for a strong, talented and ambitious woman in 19th century Australia was much tougher than it is now. Yet a brilliant and determined woman like Louisa Lawson, though grievously discriminated against and continuously derided, thwarted and undermined because she dared to excel, was never demeaned, degraded, or personally debased with the vile and scandalous detail that has been the lot of Julia Gillard. Gillard, regardless of her failings, of which most of us are well aware, is our Prime Minister. She is my Prime Minister. Who licensed the Sattlers, Joneses, Broughs, Pickerings and their cronies to ignore and trash our stake in the dignity of our country's leader? One feels helpless as the indecent tirade continues, punctuated by periodic, empty genuflections to the defunct Westminster System. A few well-aimed buckets of viscous lye wouldn't go amiss — for a start. Being a tennis tragic but somewhat mediocre at power tennis, I'm pleased to learn the birth date of Venus Williams. I've long admired her prowess on the tennis court. I'm also an admirer of the poet Henry Lawson. So it's pleasing to read of his feisty, talented and ambitious mother. Also, to Louisa - a lady who wielded a bucket of viscous lye to great effect - my great respect. How about looking at the evidence before you trash Brough's reputation. The others mentioned Sattler, Jones and Pickering have been widely condemned. Before we get on the bandwagon let us examine the remarks the Prime Minister and her ministers have directed at Mr Abbott. Hand me please a bucket of lye! I have heard it suggested that Louisa Lawson was at least a contributor to the writings of Henry Lawson, if not the writer herself. Thank you Brian Matthews for honouring this woman and her costly truth. The past few weeks have engendered in me a profound embarrassment for this country Julia Gillard's treatment by the media and individuals in that profession has been despicable Sadly I find the same attitudes repeated in many groups that I attend. Misogyny is not understood or recognised. Where do we begin to make changes? I am appalled by the way Julia Gillard has been treated but she is far from innocent in this regard. Her behaviour and that of her opponents has demeaned the high office she occupies. The pot and the kettle, no matter which gender, are black. I do not think Louisa Lawson would approve of the comparison. Shock jocks et al have simply demonstrated the fact that they enjoy acting like ill-mannered louts at every available opportunity. Just as pit-bull terriers, bred for relatively little intelligence and nasty temperaments, are often bought for fighting, it can be no surprise when shock jocks bought by media outlets for similar reasons behave as expected. Far more disturbing is the role Federal Opposition Leader Abbott has played, gleefully undermining respect for the office of Prime Minister throughout his period of office. Conveniently forgotten as the approaching election has demanded better behaviour, his inevitability as alternative Prime Minister is finally gaining grudging acceptance, but only by default. Gillard's poll ratings have reached record lows through serially defective decision-making, and the fact that most people have purely stopped listening. However much the politician currently occupying the office of Prime Minister makes a hash of her role, Australians can afford only at their peril to denigrate the office of Prime Minister in the way that has lately become fashionable. Tony Abbott may think that once he has finally been made captain of the school cricket team, things will go back to normal. But the floodgates he has opened will not easily be closed. I too am disgusted at the way the office of the Prime Minister has been demeaned. In fact why do politicians do this mudslinging in parliament.? Are their policies so shallow (or non- existent) to the degree that they have to distract us by loud senseless personal insults towards each each other like bullies in a playground or loutish supporters from a grandstand? Is there no other way to get attention? The ones that are also being insulted in all this are the people they represent who voted them into office to govern this country with responsibility and respect. As a retired teacher and parent I would not speak to children or allow children to speak to each other as our politicians do. How many more polls (sleeps) before the Election? By the way 'Julia' Gillard (She does have a first name) is showing some guts as well as positives and negatives. How will we ever stamp out Bullying in schools & anti social behaviour when loud mouthed shock jock bullies are regarded as celebrities, parliament is so adversarial and we fail to treat each other and our PM with respect!! I agree that, regardless of Julia Gillard's performance, the office of Prime Minister has been repeatedly and deliberately trashed by the Leader of the Opposition. In fact, he's been a wonderful Opposition Leader, negative, contemptuous, and ultimately very powerful in helping to shape public attitudes to the person in power. Can this man also be a leader of integrity, a statesman worth trusting, once he holds the office he's so consistently undermined? I doubt it! Thank you for a thoughtful and enjoyable article, Brian. Just as it surprised me to hear Malcolm Fraser defend the ALP better than any ALP afficionado in recent time, I took delight in your decidedly feminist article. We don't need to come to Julia Gillard's defence to promote a socially more progressive agenda, but because she is the unfortunate recipient of shameful misogynist attacks. England had Thatcher, India had Indira Gandhi, Israel had Golda Meir and Germany has Angela Merkel, but I don't believe any of these women have had to face the vitriol that Julia Gillard has. This is a sad reflection on Australia. Peter is right. The author falsely accuses Mal Brough, long after it has emerged that he is innocent. And so the Left renews its inglorious tradition of playing fast and loose with the truth.